Websites bank on the millions of internet users daily to get traffic and profit from them. For e-commerce, the World Wide Web is a huge marketplace where vendors compete for the attention of their buyers and customers. Everyone is struggling to find ways to come up with content ideas that work.Everyone is trying to use social media marketing as well as other techniques that can generate more revenues for their websites. It also takes a good combination of SEO and content marketing to stay ahead of the competition. However, through the years, a lot of myths have popped up regarding SEO that is hurting the stats of hundreds of website. Have you fallen for any of these myths? Read on to know what you should do instead. The SEO world changes rapidly. Indexing techniques, ranking algorithms - these all evolve continuously. Whether you're running a website or starting a blog, not taking care of the SEO for your pages on a regular basis will soon have you sinking downward on SERPs. In addition to that, what if you failed to follow-up on your SEO and your competitors didn't? That means they'll most likely be going up on search engine rankings at the exact same time that you're going down. More than ever, search engine rankings are at their most competitive. You have to strive hard and use the latest SEO tools and search engine marketing campaigns to ensure that you manage to stay on top. And you have to do it regularly. There are no loophole and excuses to this one if you want your website to remain as marketable and profitable as ever. In the past, H1 tags used to be one of the essential factors for SEO. They used to belong in the top tips to rank your website on search results. These days, they are still part of the best practices especially for readability and website design. However, as search engine optimization has changed over the years, H1 tags have ceased to become a viable SEO differentiation source. This means that this time, it pays to spend time researching ways to come up with content ideas for your website. It's now more important to focus on producing useful and relevant content that directly addresses your users needs. Pop-ups can certainly grab your user's attention and be a good move to get more responses on your CTAs. But, as with everything else, anything in excess can produce negative effects. Intrusive interstitials, or pop-ups that make it harder for your users to access your content, are the most annoying kind. In such cases, they are frowned upon not just by users but even on digital product reviews. In relation to this, Google ha s started to penalize websites that utilize these kinds of pop-ups. Meanwhile, some interstitials will not be open to penalization as long as they are responsibly used. Both sets of rules apply to both desktop and mobile versions of your website. You may or may not have noticed that Google has removed the "mobile-friendly" notes on the links on their SERPs. You may now be wondering why that is. Previously, the purpose of such notations is to inform users regarding which websites look great on mobile devices. 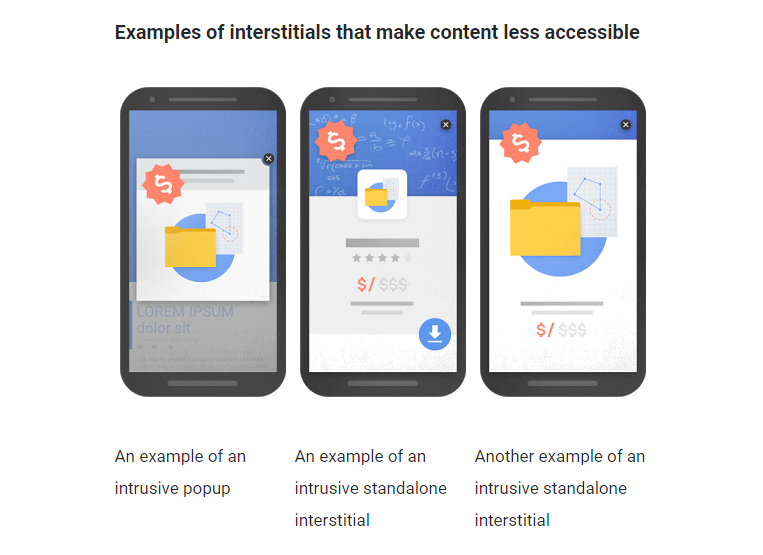 Now, however, Google has started to prioritize websites with mobile versions in its indexes. They want ALL websites to have Accelerated Mobile Pages or AMP. "But I don't have that many mobile users visiting my site," you say. 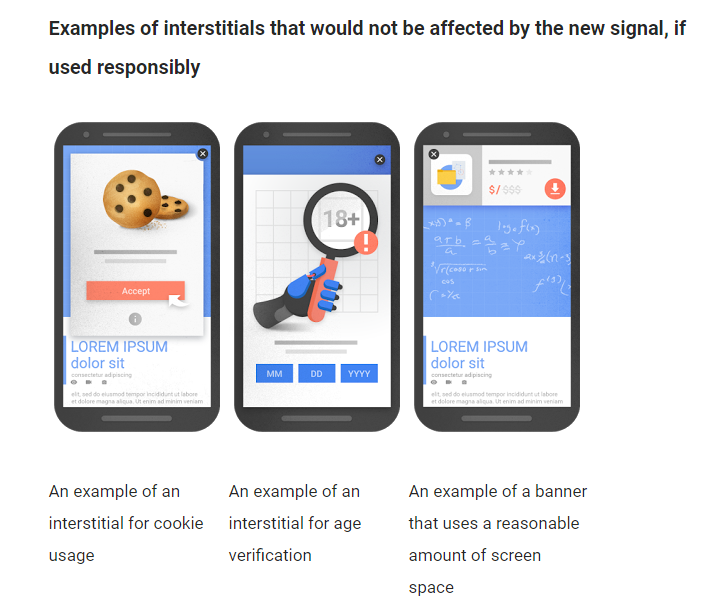 Google's new mobile-friendly algorithms, unfortunately, don't care. You HAVE to have a mobile-friendly website or down the rankings you go. Never neglect Mobile SEO, my friends. People on mobile devices comprise a humongous number of internet users around the world. Usually, when most mobile-users lookup information they need online, they do so in location-specific contexts. For example, when they lookup data regarding malls, restaurants, shops, etc. When they do so, you absolutely need to show up on the top of the local search results. Most especially if you have an e-commerce website, even if you sell services that users can enjoy regardless of location, you still should never forget to optimize for local audiences. Even resources on how to generate leads mention how necessary Local SEO is. Numbers are key to this factor. Since a huge number of people use the internet from their mobiles, if you're not on top of the local SERP, you'll be beaten by competitors who bothered to capitalize on the importance of Local SEO when you didn't. You can kiss those clicks, visits and potential customers goodbye. Google still is undeniably the biggest fish in the sea especially when it comes to search engines. And it doesn't look like that's going to change anytime soon. On the other hand, according to recent statistics, other search engines like Yahoo, Bing, and Baidu also hold an increasing number of users. Given, the search engine user statistics of these three are not of the same magnitude compared to Google's. Still, these three, as well as other search engines, should not be fully disregarded when doing SEO. It also doesn't use social media shares and numbers of followers in compiling search rankings. As such, optimizing solely for Google means you miss out on Bing users. If you're targeting 100% of the internet for your site traffic, you must optimize for at least the top 3 search engines. This is by no means the most comprehensive list of SEO myths that have been debunked. But these are some of the most common areas that can largely affect how your site figures on search engine results. Kick these myths and your website will definitely have better chances to be on top and to stay there. Do you have anything you'd like to add? We'd love to hear your insights. Let us know in the comments below. Kevin great post. I found you via VCB. I agree with everything your saying. Mobile SEO is really important, AMP moves us into a major ranking factor which is the load time of a site. I'm always updating and changing pages and tweaking the SEO to see if I can make things better. I don't use the h1 tag within posts its a default on a post title and that seems pretty much standard. I checked had almost a 3rd of all searches made. That's a lot of traffic your missing if you don't set up for it. Some bloggers forget that they need to submit their sites and so never ever appear on bing. Good article! I like your point of view and agree with you. Nice to share wise thoughts with good people :) By the way you should write an article about how to improve the website.. Something like this internet2012bustour.com It will be also very interesting and worth reading. Thank you! I think backlinking is the base of SEO, without backlinking SEO can't complete nowadays the SEO experts also focusing on backlinking and they also focus on SMM because the cause of site traffic is SMM without SMM website cannot generate traffic. SEO is something which helps you to promote your business in the unpaid search result and it is the also the best and excellent method to rank your sites and get traffic on your website, when you want to SEO of your website then you always need someone who is expert and have an experience of doing SEO and I'm also searching for that professional to do it for my cheap assignment writing UK, can you guide me more about this it will help a lot to me as an amateur of the SEO. You help us a lot to doing SEO better for your website but important thing is your website if your website is working perfectly like if their browsing speed is perfect or if they easy to use it on mobile or other related information is perfectly added on your website then it is also easy for you to do your website’s SEO in a proper way and as an SEO, I’m always thinking to make things easy and perfect for my site which will make things easy for doing SEO. Internet marketing, including SEO, draws in individuals who are as of now searching for your item or administration. You don't need to shout, move, or wear cool garments to pick up a crowd of people; they are now persuaded of their need which is the reason they went looking in any case, no strong print promotion put up front on the magazine page is required. You simply need to introduce yourself in one of those best 5 comes about and – voila! They were searching for you and you appeared ok on time! Regardless you need to persuade them that you are the better organization to buy from, however a large portion of the fight is finished. When they go to your site, in the event that you have contributed the same repetitive work to streamline the client's involvement with you by giving the substance they look for, at that point you are well on your approach to picking up another client. Valuable information! Looking forward to hear "seo'. The information you have posted is very useful. Keep going on, good stuff. Thank you for this valuable information. I have to do SEO for my website. I need some advice will you please guide me what should I do? I don’t where to start or if you shared any kind of SEO tutorial Video or Blogs so please share with me. Or should I hire SEO expert?